A few years ago, I found myself strolling through the grocery store with a friend when they directed me to the kombucha section. They strongly recommended I purchase a bottle of the good-for-your-gut elixir, which I did, even though my only knowledge of kombucha at the time was that (I thought) it consisted of magical mushrooms. Fortunately, that one impulse purchase led me to a deep-rooted love for this tea beverage which is not only delicious, but also offers a myriad of health benefits. Note: Kombucha is magical, but there aren’t actually any mushrooms. 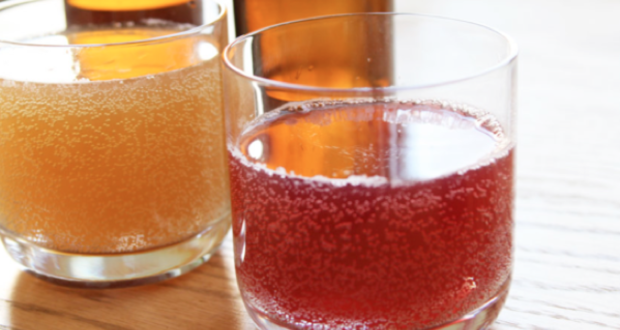 Here’s a closer look at kombucha and why you should consider consuming it on a regular basis. Kombucha is a living drink that is made by fermenting tea and sugar with the kombucha culture (which looks like a giant floating mushroom). When made correctly, it can taste like a sensationally refreshing combination of sparkling apple cider and champagne. While its origins have become clouded in time, the first recorded use of kombucha was in China in 211 BC, where it was referred to as the “The Tea of Immortality.” The name kombucha, however, is thought to have been coined in Japan in 415 AD. A Korean physician referred to as Kombu, or Kambu, used the tea to treat Emperor Inyko. He used his name and “cha,” which means tea, to name the healing concoction. The drink then made its way to Russia, where it was called “tea kvass,” and then spread throughout Europe thereafter, until interest eventually waned during the Second World War. Dr. Rudolph Skelnar stirred up the buzz on kombucha once again after the war, however, using it in Germany to treat cancer patients, metabolic disorders, high blood pressure, and diabetes. Today, kombucha is revered around the world for its ability to optimize well-being. What Is The Kombucha Culture? The culture is put into sweetened black or green tea, where it works its magic — creating a container filled with vitamins, minerals, enzymes, and good-for-you organic acids. The kombucha culture digests the sugar, and as it does so, it produces a variety of healthful organic acids including glucuronic acid, gluconic acid, lactic acid, acetic acid, butyric acid, malic acid, and usnic acid; vitamins like B vitamins and vitamin C; amino acids; and enzymes. Better still, because the culture digests the sugar in the tea, the drink tastes sweet without actually containing harmful sugars. Each kombucha brew forms a new SCOBY on the surface of the liquid, which you can divide and then share with someone else looking to start their own tea. Why Should I Drink Kombucha? Along with tasting refreshingly good, kombucha is chock-full of beneficial qualities. It’s loaded with probiotics for optimal gut health, it keeps candida overgrowth at bay, it enhances the absorption of nutrients, it fights against inflammation and the consequential bloating, it boosts mental clarity, it stabilizes mood, and it detoxifies the body. How Can I Make My Own? While kombucha can be found at a variety of health food and grocery stores, the price per bottle is quite high; it’s much more cost effective (and extremely easy) to make on your own. Prepare your sweet tea using 2 tablespoons of loose tea or 8-10 bags per gallon of hot water. Add 1 cup of organic, regular sugar per gallon to your tea. Prepare your sweet tea. Usually 2 tablespoons of loose tea or 8-10 tea bags per gallon of hot water. Prepare a large jar with the tea, leaving about 20 percent room at the top to pour in the previous starter liquid. Put your SCOBY into the tea mixture. Cover the jar with a cheesecloth and secure with a rubber band. To store, put the jar in a warm spot in the kitchen — 70-75 degrees F is optimal. Avoid direct light. The fermentation process will occur for around 7 days, and you can check your kombucha around this time to see if it is done. The taste should be tart but still slightly sweet. Pour your kombucha into individual glass bottles with airtight lids and store in the refrigerator, drinking at your leisure. It is suggested to prepare another batch so the fermentation process is ongoing. Optional: You can flavor your kombucha with fresh fruit or grated spices like turmeric and ginger. Tagged with: How Can I Make My Own kombucha? what is kombucha What Is The Kombucha Culture? Why Should I Drink Kombucha? Next: WHAT YOUR TONGUE IS TELLING YOU ABOUT YOUR HEALTH – WHICH TONGUE ARE YOU?